A video of Jean-Claude Juncker, the European Commission President, in a strangely boisterous mood at an EU summit last year has provoked a belated social media storm, weeks before Britain votes on whether to stay in the union. 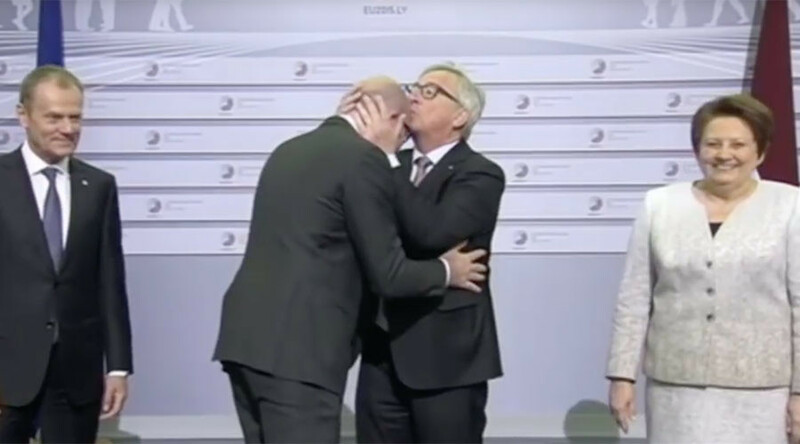 Standing in front of the cameras alongside fellow EU official Donald Tusk, who heads the European Council, and the host nation’s prime minister, Laimdota Straujuma, Juncker made a number of friendly gestures which may seem too frivolous for the occasion. He slapped several fellow leaders on the face, according to a video of the event published last week, and kissed some on the cheek. Another guest he asked to bow so that he could kiss his balding head. With two male delegates, Juncker compared the color of their ties. He also jokingly reproached Greek Prime Minister Alexis Tsipras for not wearing one. Juncker greeted Spanish Foreign Minister José García-Margallo y Marfil with a military salute. The perplexed politician, who has no military background, awkwardly returned the compliment. Earlier media reports mentioned Juncker’s cheery disposition at the media conference, buy they focused on the way he introduced the approaching Hungarian Prime Minister Viktor Orban with the words: “The dictator is coming.” Orban is known for his Eurosceptic views and is accused of attacking democratic values by critics.